most Iv'e seen are 2 in front 1 rear. The picture of the black one on his web site looks like it is running the MARS PMAC. But I'd dare say the 7kW RC motor would probably do it too. I don't know what the monash is but technically if you are exceeding the speed limit while on a push bike you can be fined. The "Monash" refers to a freeway in Melbourne. Speed limit mostly "Roadwork in progress". I've been fined for speeding on a pushbike here in Qld - no electric assist either! the trick is to make it nimble and small enough to evade down alleys and paths. 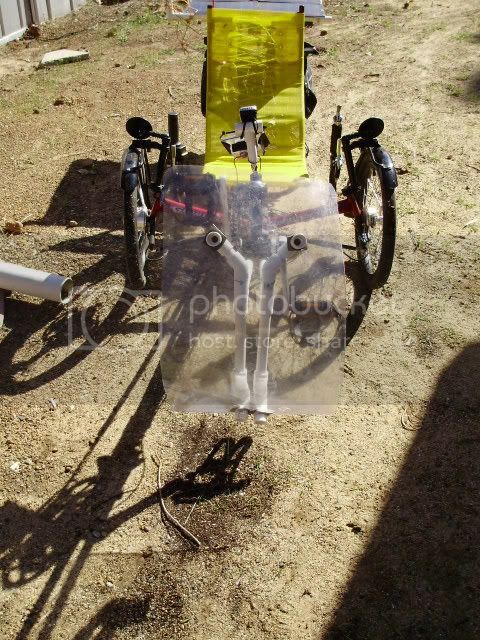 Here's a blog article on my own electric recumbent trike. I've since bought another one, but haven't (as yet) fitted the photovoltaic panels. 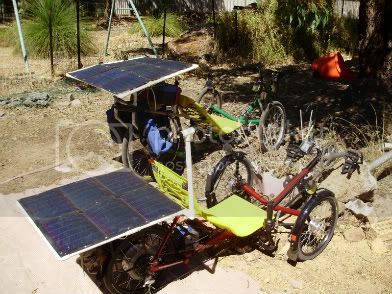 Although the motors in each trike are exactly the same (Heinzmann 200/400W), because it's turning a smaller wheel, the red one can almost climb Welshpool Road (for those who know Perth) without pedal assistance. 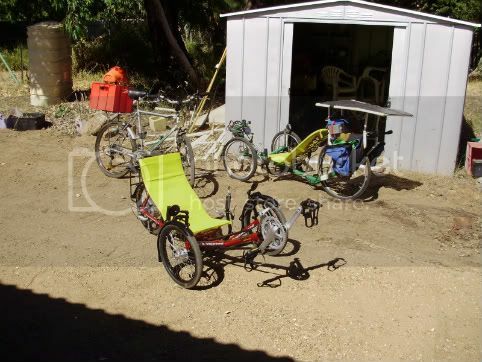 It can also tow the BoB trailer, so it's great for either local shopping or a trip to Perth and back. Last edited by electriker on Mon, 08 Feb 2010, 12:48, edited 1 time in total. the red one with the yellow seat - thats a greenspeed isn't it? my dad put 65'000km on his, only just had to get rid of it due to fatigue on the welds at the frame bottom. the green one - is that a PV on the top? They're both Greenspeed. The one with the "warped" PV array is a 1992 model (VERY ancient) GTR 20/26. It also had a break in the frame, but I sent it back and that was fixed in about 1993. Still goes like an old trouper. The warp is simply a matter of me being a bit overenthusiastic with the heat gun when I was shaping the PVC struts underneath. The array and its mounting is now into its third year, so it's allowed to be all bitter and twisted. The red one I received in December 2009, so it's still (sort of) shiny. Well, here's another update for you then. htial, All the bits you'd need to recreate this can be found on the endless-shpere forum, VRDublove posts there, you could ask him directly. 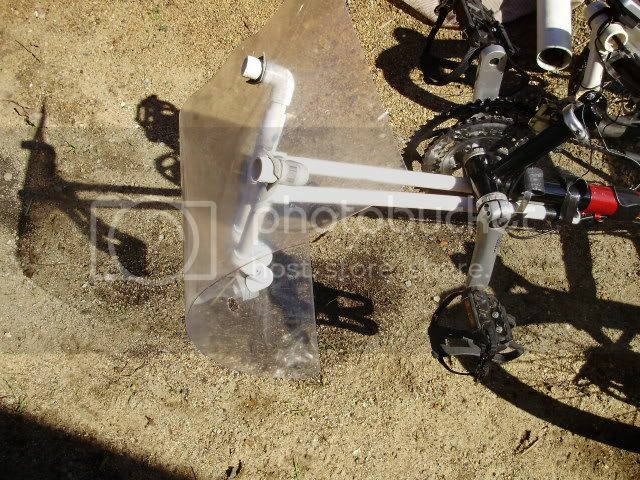 Also, there is a guy called "Recumpence" that builds electric KMX trikes, he uses Astro RC motors and lipo batts, and creates some truly sick vehicles. He can also be found on the endless-sphere forums. Yeah - speeding fine for sure - but hey - compare that to this skateboarder doing 100kph!!! !